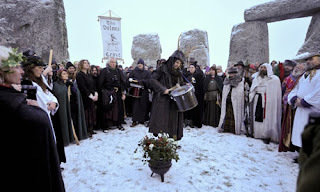 "The druid beckons us to travel back in time with him, to find out all about the mysteries of Stonehenge. He swivels to face away from us; we follow him. Suddenly the land around us changes - we're right in the heart of a dense forest, with all the plants, animals and atmosphere of Stonehenge brought to life right before our eyes. "The druid carries on regardless. He turns, and he's changed: his clothes have dated thousands of years. A quick smile and a wink reassures us as we're whisked away through millennia of human history. "And here we are - Stonehenge circa 2,400 BC, right around the time the last famous stones are being put in their fateful place. The giant megaliths resonate through the ages; just as breathlessly beautiful as they are today..."
From the twisted bodies of the land's first people, to the majestic beauty of the midsummer's sunrise over its sarsens, Stonehenge raises just as many questions as it answers about life in prehistoric Britain. Learn everything about Britain's most spectacular prehistoric landmark. Explore the plants, animals and food which made Bronze Age Britain such an awe-inspiring place. Invite your friends along to a modern-day Druid ritual at the world-famous summer solstice festival, and learn about its greatest characters. There's so much more to the story of Stonehenge than its magnificent stones – fierce foreign warriors who came seeking magical medical redemption; powerful leaders who lived and died for the magnificent monument. Stonehenge is one of the world's greatest landmarks, with a history that never ends - and we want you to be able to explore it in all its incredible glory while you enjoy our Virtual Experience. STONEHENGE SUMMER SOLTICE 'EXCLUSIVE' TOUR - JUNE 21st 2010 After the huge success of our tours in previous years we are delighted to announce our 2010 departure. "A Once in a Lifetime Opportunity!" 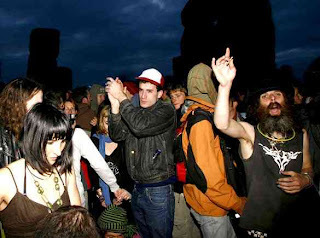 For many the impulse to arrive at Stonehenge in time for the Solstice is a little like all those people drawn to the strange rock in Close Encounters of the Third Kind. It's akin to a spiritual experience. Anyone who has witnessed the crowd become silent as the sky begins to brighten can attest to that. You will enjoy 3 - 4 hours within the circle at sunset on June 20th or sunrise on June 21st. The small group (16 people) nature of this tour means you can have a real personal experience. Due to the nature of this 'special access' tour and the strict entry conditions that English Hritage impose please register your interest for this tour on the form below and we will contact you with booking details and terms and conditions. This is on a first come first serve' basis. The find is already challenging conventional wisdom about how Stonehenge was built - and what it was used for. 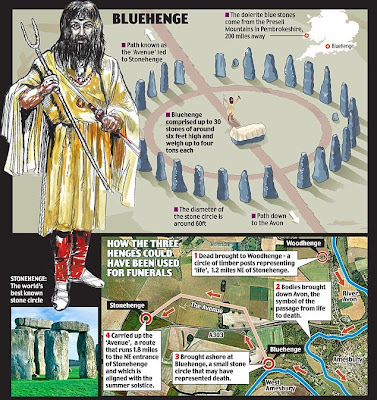 Bluehenge was put up 5,000 years ago - around the same time as work began on Stonehenge - and appears to have been a miniature version of it. The four-ton monsters, made of Preseli Spotted Dolerite - a chemically altered igneous rock harder than granite - were mined in the Preseli Mountains in Pembrokeshire and then rolled, dragged and floated the 200 miles to the site on the banks of the Avon in Wiltshire. Once installed, the stones would have been polished to a dark blue with silver flecks resembling the night sky. Bluehenge lies at the end of the 'Avenue' - a ritual pathway that connected Stonehenge to the Avon. Stonehenge itself was built and rebuilt over 600 years in three main phases. The first - begun in 3000BC - saw the creation of a ditch and bank which later enclosed a circle of 56 holes for posts or stones. It suggests that the creators of Stonehenge originally built two circles - one with 56 stones at Stonehenge, and another with 27 at Bluehenge. The stones of the smaller circle were eventually incorporated into the bigger one. 'Any one person who says they have the answer is being a bit over-confident,' he said. Professor Geoffrey Wainwright, who found the source of the Stonehenge stones in Wales with Professor Darvill, said: 'This [new] henge is very important because it forms part of the picture of ceremonial monuments in the area and puts Stonehenge into context. 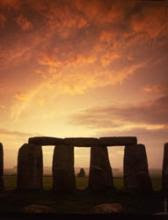 The creators of Stonehenge - who saw the Stone Age pass into the Bronze Age - were farmers who lived in small villages in huts made of wooden stakes and twigs, covered with a thick layer of clay and chalk. 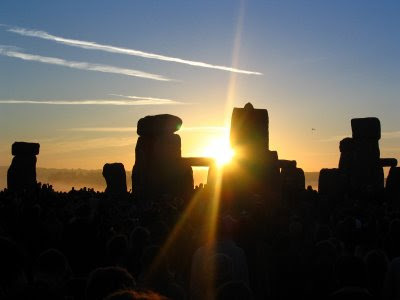 No one knows what gods they worshipped, but the alignment of Stonehenge to the solstice shows that the Sun - and maybe the Moon - was important. "We question whether, in this landscape of scale and huge horizons and with a very robust end point that has stood for centuries and centuries, this is the right design approach?" said Diane Haigh, CABE's director of design review. "You need to feel you are approaching Stonehenge. You want the sense you are walking over Salisbury Plain towards the stones." But the "twee little winding paths" were "more appropriate for an urban ­garden" than the "big scale open air ­setting the stones have", she added. The many columns were meant to be "lots of trunks" holding up a "very delicate roof", she said. "Is this the best approach on what is actually a very exposed site. In particular, if it's a windy, rainy day, as it is quite often out there, it's not going to give you shelter. We are concerned it's very stylish nature will make it feel a bit dated in time, unlike the stones which have stood the test of time". CABE believed the location of the ­centre, at Airman's Corner, is good, and were pleased "something was happening at last", but questioned the "architectural approach". The centre has the full support of local architects on the Wiltshire Design Forum, and has been passed by the local planning committee. 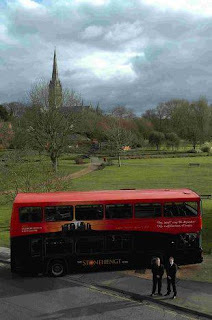 Nevertheless English Heritage recognised it was an emotional and divisive subject. "Innovative architectural designs will always polarise opinion, and often nowhere more so that within the architectural world itself," it said in a statement. "The Stonehenge project has to overcome a unique set of challenges," it said. "This has required a pragmatic approach and, following widespread consultation, we maintain the current plans offer the best solution". Stephen Quinlan, partner at Denton Corker Marshall, defended the design. The roof was meant to be a "sun canopy" and not offer weather protection in what was, principally "an outdoor experience". "It's not an iconic masterpiece. 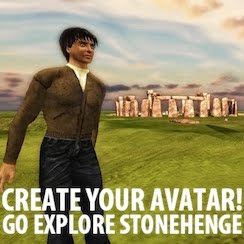 It's a facility to help you appreciate the Stonehenge landscape. It's intellectually ­deferential in a big, big way to Stonehenge as a monument. "I wouldn't even mind if you couldn't remember what the building looked like when you left. The visitor centre is not the destination," Quinlan said. However, he added: "We don't take criticism from CABE lightly. And we are ­crawling through their comments to see if there are any improvements we can make." Their findings are revealed tomorrow in British Archaeology magazine, whose editor, Mike Pitts, an archaeologist and expert on Stonehenge himself, said: "It is utterly surprising that this is the first survey for such a long time, but the results are fascinating. Stonehenge never fails to reveal more surprises." "The time these two concentric hedges around the monument were planted is a matter of speculation, but it may well have been during the Bronze Age. The reason for planting them is enigmatic." 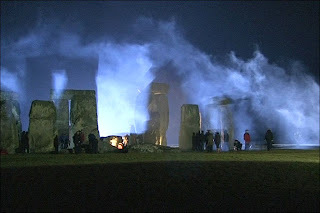 On Tuesday night, February 2, Wiltshire's ancient stone monument was taken over by a film crew.....filming season five of BBC 1's Doctor Who. Turns out that when the moon lies above the stone circle and the sun is on the opposite side of the earth, the stone circle acts as a gateway to a parallel time and place. Standing in the centre of the circle can allow one to be at one with the entire universe but unfortunately induces runaway ageing and exposure to other more evil personalities bent upon conquest. Dr Who finds himself imprisoned within the stone circle of an advanced extra-galactic civilisation and is held as a hostage until dastardly demands are met. The clock is running and the Doctor is rapidly ageing towards infancy. A twist in the tale is the entity that is allowed into the modern Human world when the stone circle is activated. Sadly, the choices are harsh.....either allow the proposed McDonalds drive-through planned for the Avenue, the bowling alley, the souvenir shop and the vast visitor facilities or, the Doctor will be wearing nappies for the remainder of this series and the evil personality (a hybrid mutation of David Icke and Schliemann) will win executive control of English Heritage. Local fans, braved the rain hoping to catch a glimpse of the action: "I've been a fan of Doctor Who since I was five, that's 35 years now, and this has been the first chance I've had to see it being filmed." ...plus returning professor River Song (Alex Kingston) have all been spotted on set - along with a brazier or two - the rumour is that the latest episodes including The Eleventh Hour, The Beast Below and Victory of the Daleks will all be set 'some time in the past'. Ancient man had his own form of 'sat nav' that helped him find his way across Britain, according to new research. The sophisticated geometric system was based on a stone circle markers. Our ancestors were able to travel between settlements with pinpoint accuracy thanks to a complex network of hilltop monuments. Researcher Tom Brooks analysed 1,500 prehistoric monuments, including Stonehenge and Silbury Hill in Wiltshire, and found them all to be on a grid of isosceles triangles - those with two sides of equal length - each pointing to the next site. He believes this proves there were keen mathematicians among the ancient Britons 5,000-6,000 years ago, at least two millennia before the Greeks who were supposed to have discovered geometry. Many monuments are 250 miles or more away but GPS co-ordinates now show all are accurate to within 100 metres and provided a simple map for ancient Britons to follow. Incredibly, the triangles still exist today as many medieval churches, abbeys and cathedrals were constructed on top of the original stone circle markers. He said: 'It is known that many, if not all, early churches, abbeys and cathedrals were constructed on ancient sites and this diagram illustrates that point. 'This ancient form of geometry permits the production of various patterns across our landscape linking prehistoric settlements and waymarks. 'Such is the mathematical precision that it is inconceivable that this work could have been carried out by the primitive indigenous culture we have always associated with such structures. 'Such patterns could only have been the work of highly intelligent surveyors and planners which throws into question all previous claims as to the origin of mathematics. Each was built within eyeshot of the next. Using GPS co-ordinates, he plotted a course between the monuments and noted their positions to each other. He found that they all lie on a vast geometric grid made up of isosceles 'triangles'. Each triangle has two sides of the same length and 'point' to the next settlement. He said: 'The modern-day diagram links 13 churches within four counties of south-west England, ranges across 60 miles, and is a remarkably accurate arrangement of isosceles triangles projecting to varying compass points. 'Prehistoric Geometry in Britain: the Discoveries of Tom Brooks' is now on sale priced £13.90.